lasers and has one in his office that he uses regularly. How does Dr. Reagin utilize lasers in taking care of you and your smile? Muscles or tissue called frena can cause spaces between teeth or areas where teeth appear set back from other teeth. A laser can be used to shorten or remove this tissue with minimal discomfort. A laser prevents the need for surgery where sutures or scar tissue can be a result. Removing the tissue allows for spaces to be closed and helps to prevent recessions from forming. Have you ever noticed someone’s smile where it looks like a part of the gum is covering too much of a tooth? When this happens it can prevent an orthodontist from placing a bracket on the tooth. With the use of in-office laser treatment, Dr. Reagin can free the tooth from the gum versus waiting for it to push itself fully through or having to send a patient to an oral surgeon to remove the tissue that is blocking the tooth. By freeing the tooth sooner Dr. Reagin can place a bracket on the tooth and begin moving it into place with your other teeth. This typically results in less time in braces, which everyone loves! Aphthous ulcers can form for a variety of reasons and sometimes it is due to braces rubbing on your gums. Did you know they can last up to two weeks? Instead of waiting out aphthous ulcers and for the pain associated with them to go away, Dr. Reagin can use a laser to provide immediate relief with the added benefit of preventing a sore from reoccurring in the same location. Learning to brush and floss properly with braces is an important skill. Sometimes as you learn to properly care for your teeth with braces the gums become puffy because you cannot get the toothbrush beneath bracket leaving bacteria behind. The bacteria builds up and can cause infection and gum swelling. The swelling can be reduced with a laser to enable patients to brush and floss correctly to prevent this from happening in the future. Your braces are removed and your teeth are beautiful, but why do some teeth look longer than others? This is most likely due to an uneven gum line. It may be possible for Dr. Reagin to reshape your gum tissue using a laser for your teeth to all look the same size. Dr. Reagin believes in continued educational growth for himself and his staff in order to provide his patients with the best possible care. Becoming certified to use lasers has been part of this growth. He and his staff regularly attend classes and seminars to make sure they know current techniques and procedures to provide you with your best possible smile. Call us today for your free consultation. 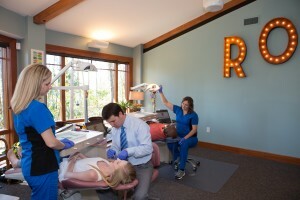 The team at Reagin Orthodontics would love to develop a plan specific to you and your needs!